A rowing machine, also known as an ergometer or indoor rower is commonly seen in many fitness centers. These machines can simulate water rowing, thereby providing a means of practice for professional rowing athletes. Many athletes who compete in different sports events also use rowing machines for cross training, according to the International Federation of Rowing Associations. Exercising on a rowing machine has several benefits. 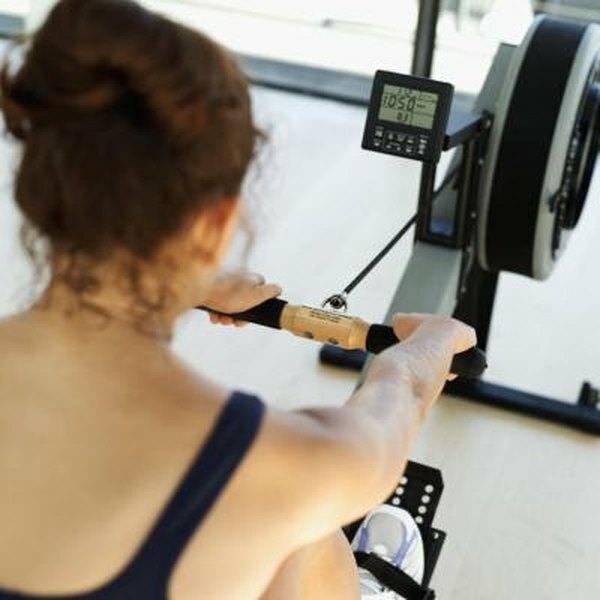 USRowing, the national governing body in the sport, says that rowing is one of the few exercises that use major muscle groups from all parts of the body. Rowing machine exercise, similar to the sport, involves both the upper and lower body. You must use your abdominal muscles, back, arms, chest, legs and the buttocks while on the rowing machine. Overall, rowing is an excellent aerobic activity that benefits the entire body. The motion of rowing expends a lot of calories, which is beneficial to weight loss and management. Most rowing machines have sliding seats, on which you move back and forth as you row. This motion enables you to use your muscles in the lower back and thighs. Rowing also tones your arms. Rowing continuously for long intervals requires strength, discipline and endurance. The benefits include improved aerobic capacity, toning and strength. Because you are sitting during the process of rowing, there is no weight bearing involved. Your joints and bones are free of any stress or impact that are common in activities such as running, jogging, stepping or skipping rope. Proper use of the rowing machine leaves very little room for chances of any kind of injury. Using a rowing machine involves all the major joints and muscles in your body. Over time, this activity contributes to improved flexibility. Vigorous rowing engages your muscles and strengthens them, improving your strength and muscular endurance. According to USRowing, rowers have been referred to as the fittest athletes in the world. Rowing machines are also highly efficient, because they let you work on your entire body in a short amount of time. Rowing is an easy activity for people who wish to embark on a fitness routine. It is appropriate for beginners, experienced sportspeople and people who are regularly active. Because it is low-impact, it is also suitable for the elderly. Young kids can also benefit from the rhythmic motion of rowing machine exercise.